NoHo Arts Center, North Hollywood, Calif. The stage of this 50-seat theatre is roughly the same size – about 500 square feet – as the principal room of that Amsterdam warehouse where Anne Frank, her parents, sister and four other German Jews hid from the Nazis back in 1944-1945 – and powerfully conveys the claustrophobia and fears that was then the life, the reality, of those unfortunate people. The stage is set as the real room was, some 70 years ago – jammed with a few sticks of furniture, mismatched chairs, several narrow beds, a tiny desk with a lamp, an anachronistic refrigerator, curtains for minuscule zones of privacy – and a door, upstage center, that is both entrance and exit to the outside world. That external world is no longer available – at least not as long as the Germans occupy The Netherlands – for Otto Frank (Jack Kandel), his wife Edith (Georgan George), their daughters Margot (Jessica Richards) and Anne (Valerie Rose Lohman), Putti Van Daan (Warren Davis), his wife Petronella (Susan Priver), their teen-aged son Peter (Nick Reilly) and a dentist, Mr. Dussel (Shelly Kurtz). All are desperately trying to escape the Germans’ killing machine. Things do, however, come into their constricted world – food, books, occasional cigarettes, a delightfully unexpected strudel, a radio – through the courage of a few Dutch citizens, former employees of Otto Frank’s firm, who not only hide them but sustain them as well: Miep (Mindy Barker) and Mr. Kraler (Steven Scot Bono). But nothing must go out of that world (aside from the two Dutch workers) – no sounds, no lights, no hints of eight terrified humans – for fear of attracting the attention of the Nazi occupiers. Lohman, already an accomplished actor at the age of 16, impressively captures the innocence, the insouciance, the impertinence and the impatience of a 13-year-old girl. As Anne, she can fiercely hate one moment – her mother, say, or Mr. Dussel, or Mrs. Van Daan – but intensely love the next – her sister, say, or Miep or, to her surprise and nascent sexual awakening, Peter. If she were alive today and attending any American junior high, she’d fit right in. Equally impressive is Kandel. 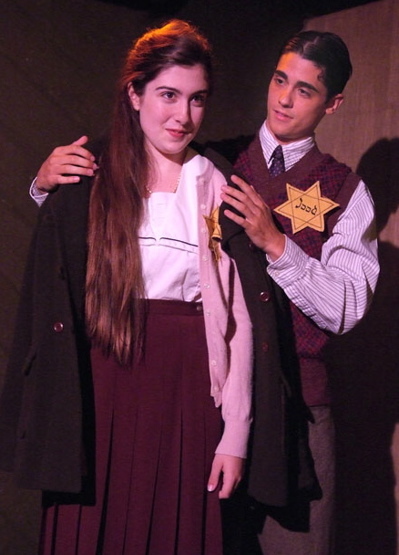 By all accounts, Otto Frank was an affable and reasonable man; Kandel is that man as he damps the inevitable flare-ups that can, and do, arise between very stressed people in very cramped quarters. In short, he’s “there” for his wife, his daughters, the three Van Daans, Dussel, Miep and Kraler, as they strive to maintain their sanity in a world unhinged. Anne, ever the observant one, records these incidents along with her comments about the others, in her diary. It became the root stock of a book (actually, several books), a play and a movie. In 1997, Kesselman rewrote, by her own estimate, “70 to 80” percent of the original Goodrich and Hackett 1955 stageplay to incorporate more of the diary that was not included in the original play or the 1959 movie. To laud Lohman and Kandel is by no means to slight the skilled performances of the other six: Mrs. Frank’s (George) growing despair; Margot’s (Richards) quiet stoicism; Mrs. Van Daan’s (Priver) vulnerable shallowness; Putti’s (Davis) selfishness; Dussel’s (Kurtz) obtuseness; Peter’s (Reilly) decency and Miep’s (Barker) and Kraler’s (Bono) unflinching courage. Like a symphonic conductor, director Belnick draws them out to play off each other with subtlety and credibility. Adam Haas Hunter’s set emphasizes the tightening noose around their necks. Matthew Richter’s sound and lighting shifts their moods seamlessly from day to night, hope to fear, and, finally, euphoria to tragedy – as the Nazis discover, capture and ship the eight off to concentration camps before the Allies’ invasion and pushing back of German forces can reach Amsterdam. Only Otto Frank survived. And, of course, his daughter’s diary.